Posted under Health Guides. Updated 2 July 2018. You probably know someone with lactose intolerance. Maybe that person is a family member, a friend, or you. It’s most common among Asian Americans, African Americans, individuals of Jewish descent, Mexican-Americans, and Native Americans, but affects people of all races and ethnic backgrounds. That being said, any person could have lactose intolerance. Lactose is a natural sugar found in milk and other dairy products. Your body makes an enzyme called lactase that breaks down lactose into smaller sugars that your body can then digest and use for energy. If you have lactose intolerance, your body may not be able to break down all the lactose that you eat or drink. People with lactose intolerance do not produce sufficient amounts of lactase needed to break down the lactose. This causes undigested lactose to make its way to the large intestine where bacteria starts to digest it. This can cause nausea, stomach cramps, gas, bloating, and diarrhea for people with lactose intolerance if they eat or drink milk or foods that contain a lot of lactose. How can I tell if I have lactose intolerance? If you have nausea, stomach cramps, gas, bloating, or diarrhea within 30 minutes to several hours after eating or drinking foods with lactose, you may have lactose intolerance. What should I do if I think I have lactose intolerance? Do not try to diagnose yourself. If you think you might be lactose intolerant, it is important for you to see your health care provider. The same discomfort caused by lactose intolerance could also be caused by other health conditions. Your health care provider is the only person who can confirm that you are lactose intolerant. Once your health care provider figures out what is causing your digestive discomfort, you can work with them or a dietitian to try to manage your symptoms. How can my health care provider tell if I’m lactose intolerant? Your health care provider will likely ask you a number of questions about your symptoms and what a typical day of eating looks like for you at your appointment. For some individuals, the first suggestion from a health care provider to confirm a lactose intolerance diagnosis is to stop eating or drinking foods with lactose and to see if your symptoms improve. You may also have a hydrogen breath test to confirm this diagnosis. A hydrogen breath test is done by breathing into a machine that measures the amount of hydrogen in your breath within 90 minutes of consuming lactose. If you are lactose intolerant, your body will produce more hydrogen than if you are lactose tolerant. Can some people be more lactose intolerant than others? Yes. There are different degrees of lactose intolerance. For example, some people may be able to drink 1/2 cup of milk without symptoms but have symptoms when they drink 1 cup. Other people may have difficulty drinking even less than 1/2 cup of milk. Over time you will learn how much milk or other dairy products you can handle without having symptoms. Are there different “types” of lactose intolerance? Yes. Some people are born without the ability to make the enzyme lactase. 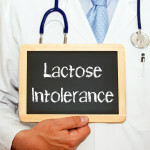 People with this type of lactose intolerance have the most difficulty drinking or eating foods that contain lactose. More commonly, people become lactose intolerant as they grow older and their body slowly makes less and less lactase. Some people become lactose intolerant after having surgery or a gastrointestinal infection. Will I always be lactose intolerant? What should I do if I’m lactose intolerant? If your health care provider has told you that you are lactose intolerant, there are several things you can do so you won’t feel gassy, bloated, or have stomach cramps or diarrhea after you eat lactose-containing foods. Know what foods and drinks contain lactose. Lactose is in most dairy products, some baked and processed foods such as bread, dry cereal, candy, cookies, salad dressings, cream soups, drink mixes, and prepared foods like pizza and lasagna. Pay attention to food labels. Food labels list all of the ingredients in order of the amount. The ingredients included in the largest amounts are listed first while those at the end of the list are in the smallest amounts. For example, if milk is listed first, you know that the product contains mostly milk. If you are lactose intolerant it may be a product that you want to avoid or eat in small amounts. Start with small portions of dairy foods. If you can tolerate small portions, you might be able to add more a little at a time. As you slowly add dairy foods over time, you will be able to figure out just how much lactose your body can handle. Combine dairy foods with nondairy foods. Eating dairy foods with other foods slows the release of lactose into your body. This makes it easier for your body to digest and breakdown the lactose. Eat smaller portions of milk or dairy products more frequently. Instead of drinking full servings (1 cup or 8 ounces) of milk, try drinking smaller servings (1/2 cup or 4 ounces) throughout the day. Eat dairy foods that are naturally lower in lactose. Cheese and yogurt generally have less lactose than milk. This is because the lactose is partially broken down during the aging process in cheese and by the bacteria in yogurt. Specifically, aged cheeses like parmesan, swiss, and brie, and yogurts that say “live active cultures” on the label tend to be low lactose options. What if these suggestions don’t work? If you still have discomfort after trying out these ideas, you may try a lactase supplement, such as Lactaid® or a generic brand, before having foods that contain lactose. You can buy the lactase supplement as a chewable pill or liquid drops for a milk product. The supplement can be purchased without a prescription and will help your body to break down the lactose in the foods you eat or drink. You can also enjoy milk or ice cream that is labeled as lactose free. The brand Lactaid® also sells dairy products with the enzyme lactase already added into their foods, so this can also be helpful if your body has a hard time tolerating even small amounts of lactaid. Learn about secret ingredients that contain lactose. These ingredients include dry milk solids (including non-fat milk solids), buttermilk, lactose, malted milk, sour or sweet cream, margarine, whey, whey protein concentrate, and cheese. Sauces, dressings, and soup often have lactose. Baked and processed foods such as cookies, cakes, and pancakes may also contain lactose. Check your food labels! Some medications contain lactose. Ask your health care provider if there’s lactose in any medications that you might be taking and read the label yourself, too. Remember the calcium. If you don’t drink milk you need to make sure you’re getting enough calcium from other sources in your diet. If you’re lactose intolerant, you probably won’t need to completely cut out milk or other dairy foods from your diet. These foods provide calcium for your body and other important nutrients. Managing your lactose intolerance with support may be even easier than you think. Does lactose-free milk have the same amount of calcium and vitamins that regular milk has? I’m not lactose intolerant but I heard that lactose-free milk is better for you. Do you have any tips or should I stick to dairy products to avoid not getting enough calcium or other nutrients?